For $25, you can join the Toledo Zoo in releasing into the Maumee River a fish that hasn’t swum those waters in over a century. The goal is to return lake sturgeon to the river in hopes they will once again spawn there. People who buy a sponsorship in person can release a fish with buckets and/or nets. Each sturgeon will be tagged with a microchip so that it can be permanently identified, according to Kent Bekker, the zoo’s conservation and research director. The event is 10 a.m. to 2 p.m. Saturday, October 6, at the city’s Toledo Boat Launch. Earlier this year, Ohio became the third state in the nation to build a streamside sturgeon rearing facility. The earlier efforts by Wisconsin and Michigan populated the tributaries of Lake Michigan and Lake Superior with sturgeon. The Toledo Zoo’s efforts are the first to focus on the Maumee River and Lake Erie, Bekker said. The facility was funded by the Great Lakes Fish and Wildlife Restoration Act Grants Program and the U.S. Fish and Wildlife Service, Bekker said. Funding from the sponsorships will be used to maintain the rearing facility. The Fish and Wildlife Service collected about 600 eggs from the St. Clair River and brought them to the facility to be raised into fish. The remaining 2,400 fish were raised at a U.S. Fish and Wildlife Service hatchery in Genoa, Wisconsin. By rearing them at a young age in the river, the fish will be able to use their homing ability to return and spawn when they reach adulthood, zoo officials said. 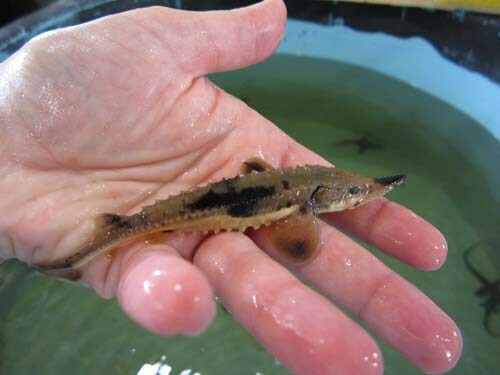 Lake sturgeon were abundant in the Great Lakes until the early 20th century, when overfishing, habitat destruction, and pollution brought the population numbers in the Maumee River to zero according to the Fish and Wildlife Service. Ohio has no reproducing populations. The fish can live to more than 150 years and played a key role in the Great Lakes ecosystem historically, acting as a bottom-feeder. Their eggs and young become food for other species. Lake sturgeon remain protected in all eight Great Lakes states and Ontario. How do I get an application to become a fish parent?